The case is glued up and ready for a few detailing tasks as the mood strikes. Which means I can now take “final” drawer measurements with confidence. 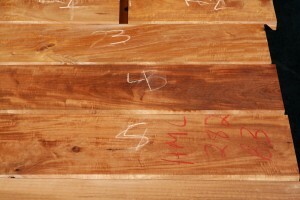 I am using a new-to-me material for drawer sides and backs, Sugar Pine. 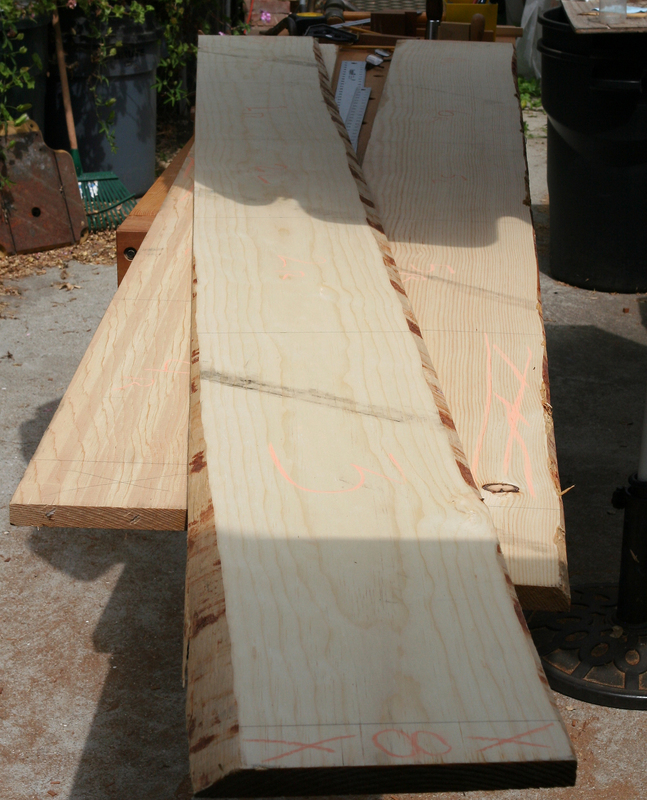 I cut to rough size and took it down to about 11/16 inch thick on the power planer. All seems stable, but I’ll leave it for a few days then take it down to about 1/2 inch final thickness (for sides and backs). Eighteen pieces. I had ordered two boards for the drawer fronts and a thicker board for the show top from Rich Petty of Greener Lumber, LLC. Somehow I miscalculated material required. So last week I ordered one more 9 inch x 6 foot 4×4 board. It is not from the same log, but hopefully the color will match. Figure looks like a reasonable fit. The additional board arrived today, so I marked material for the fronts, rough cut about 1/4 inch over on height and 2-3 inches longer than final. 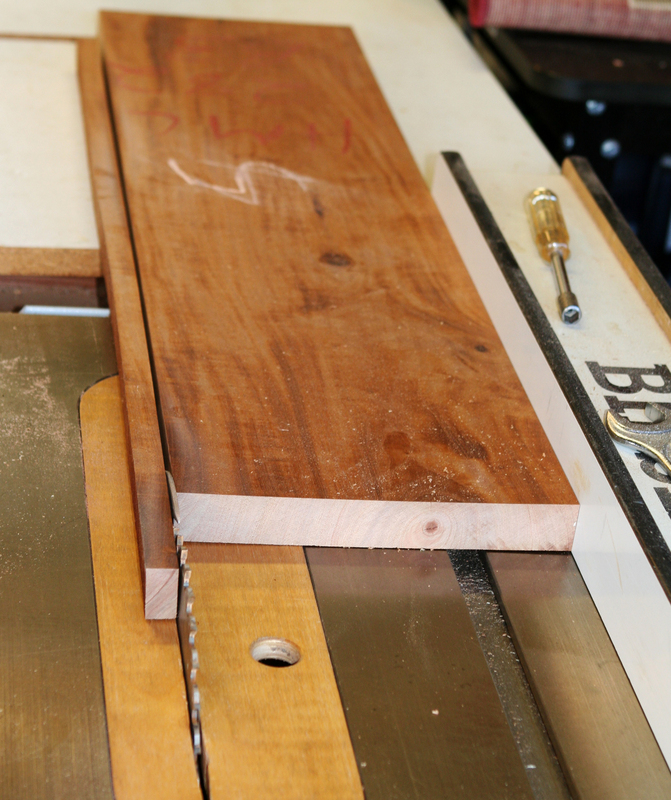 These boards will require a fair amount of work to achieve flat and square. Will let them sit for several days before going further. Hi Tom – I’ve been really enjoying this build and can’t wait to see the finished product. I am doing a similar build right now and have a question. It appears from the pictures that the drawer guides are screwed into the rear rail (screw going through the lap joint). Would you mind explaining this? Are the drawer guides glued in the front? Is the screw in an oversized hole? Why bother with the screw? Hi Brian, the guides are screwed into the back web rail in normal-sized hole. No glue. I do not recall why I put the screws in the back. My initial thought would generally be for the screw to be in the front to fix that location and allow case movement to go backwards (relatively speaking). Not sure if I had something in mind, or just made a decision without (proper) thought. The project is now completed. Did not make posts along the way as it seemed I had so many different areas I was working on, without good photo opportunities. I’ll post some pix of the finished piece soon. And maybe do some fill in discussion afterwards. Thanks for checking in. Thanks for getting back to me Tom. So then the guides are allowed to move back and forth in the front lap. Have you had any issues with the guides remaining square to the front or is the front lap tight enough that it keeps it square? Reason I’m asking is that this is how I’m planning to do my own build. Thanks again! Yes, the laps are tight enough to keep things square. I’ve only had the dresser in position for a few weeks and haven’t even loaded it up yet. But I cannot imagine any difficulties in that regard. 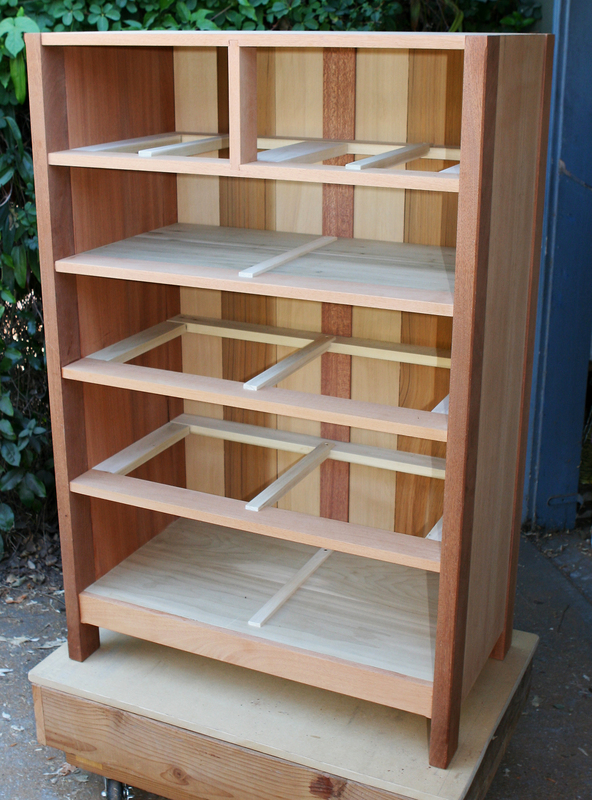 A plus, if I had made the guides fixed at the front, is that protruding (guide) surface could also act as a drawer stop. As a side note, the case is flush to legs and drawer opening so the guides are not all that necessary. A more typical construction is to have a case side that is thinner than the legs which allows drawer insertion/removal to go askew. But a little redundancy never hurt…until it does. Take care. Thanks Tom. My design is a typical dovetailed case, but I like the idea of having the drawer guides even though they’re not entirely necessary just because this will be an everyday use dresser, so I want the drawers functioning well. I like the redundancy too. This has been very helpful. I appreciate it! Hello Brian, I just posted a photo gallery of this build with plenty of in-process images. See http://tombuhl.com/Gallery/Site/Toms_Chest_of_Drawers_2014.html.